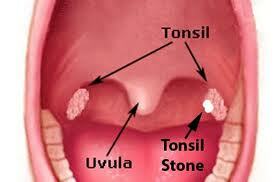 The Huffington Post published a story on tonsil stones on April 4, 2012 which can lead to bad breath. The author, who is a dentist, gave the perspective of conservative treatment strategies to resolve bad breath whose root cause is due to tonsil stones otherwise known as tonsilloliths. Such "stones" are produced and ejected from tonsils and consist of mucus, dead cells and other debris that collect in the deep pockets of the tonsils and gradually condense into small, light-colored globs. Bacteria feed on this accumulated matter, giving rise to the odor which is downright foul-smelling (and foul-tasting). The only known cure for tonsilloliths is tonsillectomy (no tonsils = no tonsil stones), though the article does outline more conservative measures which are encouraged first prior to surgery. More recently, there is a minimally invasive procedure called tonsil cryptolysis which also has the potential to eliminate this problem prior to considering tonsillectomy. Watch video of this procedure. Watch video of where snoring comes from here!